Our trip to Mussoorie started off early on a Saturday morning. Any other Saturday would have had me resting on my bed, with a nice, cozy pillow behind me and my laptop on my lap, loaded with interesting movies to spend the weekend. But this Saturday was something special. The very thought of going out of Delhi made me wait in anticipation for the weekend. When I counted the number of hours I slept the previous night, I had hardly slept for 2 hours; but I was up and running when my alarm rang and made the last minute preparations before we left for Mussoorie. By the way, let me tell you that we were not the only ones visiting Mussoorie that weekend. Amidst the huge crowd of tourists, I could see a familiar face in the distance. “Anjali, look this side,” I screamed at the top of my voice. I came to know of their visit only when I bumped into Anjali at the Mall Road that evening. 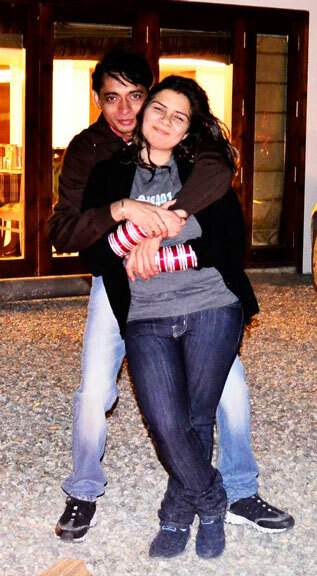 Back then we hardly used to meet because of our so-busy schedule, both professionally and personally. But just see what fate has in store for us; we do not get a chance to meet in Delhi, but ended up seeing each other in a place 280 km away from here. What an irony. We travelled to Mussoorie by road as the trip was planned in haste and by the time we made up our mind, there were no train tickets available. We booked a cab from Delhi for two days. As we wanted to reach the place as early as possible, we started our journey quite early, at around 4.30 in the morning. Since it was early morning, it was still dark outside and I was dozing off at times sitting inside the car. The first rays of the sun came in only after we crossed Modinagar. We took the NH58 till Roorkee (via Meerut and Muzzafarnagar) and NH72-A till Dehradun. 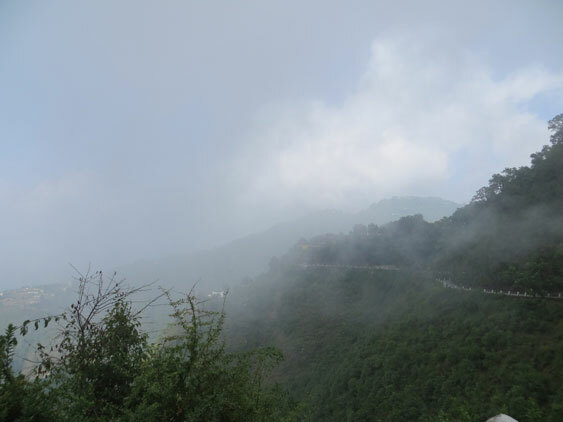 Thereon, we followed the state highway (known as the New Mussoorie Road) to Mussoorie. 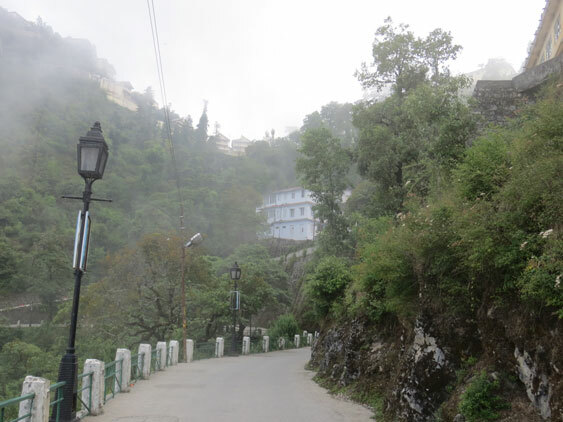 We reached Mussoorie in the afternoon, around 3 and checked in to our hotel. Though the hotels remain occupied most of the time of the year, we did not have much difficulty in booking a deluxe room at Hotel Oak Bush. The hotel (though we have to go up a steep, hilly road) is located in the vicinity of the Mall Road and so we found it very convenient. Another reason why I liked it was for the amazing view from the hotel. It was raining since morning but had stopped for a while when we reached our hotel. The whole place was then covered in cloud and it was just so very beautiful to see everything white around you. The hotel room was also quite spacious and the best part was the balcony attached to it from where the view of the entire Mussoorie city gave a remarkable feeling. I remember standing there at night, enjoying the dimly lit lights in the distance and then watching them go off one by one, plunging the whole city into darkness. Well, after freshening up we headed to the Mall Road. The Road stretches from the Picture Palace at its eastern end to the Public Library at its western end. We took a stroll around the place, hopped in and out of the shops, looked at the wares that had been put out in front and took pictures at short intervals of us and of the beautiful surrounding. We took a walk till Gandhi Chowk, which is a popular tourist point at the extreme end of the Mall Road. As black clouds started hovering over the sky again, we decided to go back to the hotel as it could have rained any moment. As my husband kept searching for a probable short cut on Google Maps, he found a road which runs parallel to the Mall Road. Called the Camel’s Back Road, it is around 3 kms long and takes you on a peaceful walk amidst nature. The wilderness and the majestic view of the blue hills that will run on your left as you walk will be in contrast to what you experience on the other side at the Mall Road – crowd, din, vehicles, and hawkers squatting on the roadside. As we took our small steps enjoying the nature, we came across the Ashram of Sant Nirankari, from where people were coming out after attending the evening prayer service. There is also a cemetery along the road belonging to the British era, which was locked from outside. One can also enjoy a horse ride on this road if walking this long stretch sounds tiring. The road starts at Library point and ends at Kulri Bazaar. Though we have missed this opportunity, you should not miss to enjoy a ropeway ride to the second highest peak of Mussoorie, Gun Hill. The ropeway distance is about 400mtrs and the ride takes twenty minutes. 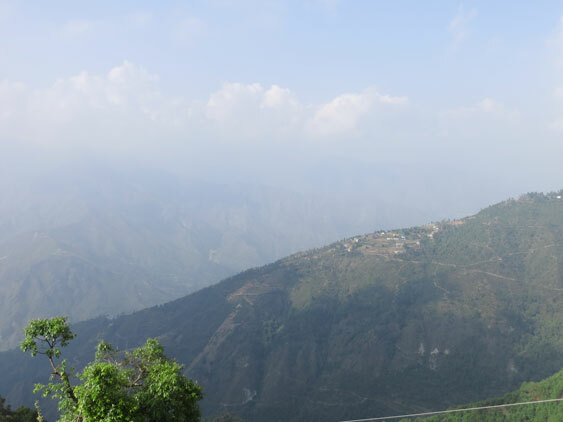 Gun Hill offers a beautiful panoramic view of the Himalayan ranges and of Mussoorie town and the Doon Valley. I would also not have loved to miss the evening view of the Dehradun valley from the Mall Road but we knew that rain would have spoiled it. We were lucky enough to have reached our hotel before it began to rain again. It was dusk by the time we returned and the long day travel and walk had made us so exhausted that we went to bed early, only to wake up all fresh the next day. Luckily, it was not raining the next morning. We made a list of all the places we can visit before we head back to Delhi. After a heavy breakfast, we checked out of the hotel and set out for Kempty Falls. The heavy downpour the previous night had made the roads slippery and the driver had to be cautious while driving his way up the slope. 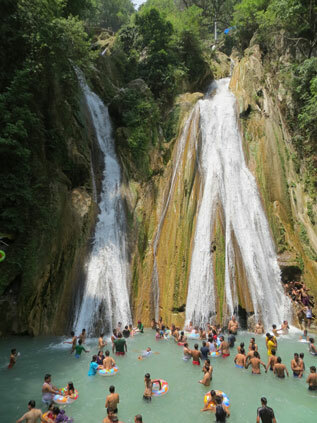 Situated 13 kms away from Mussoorie on the Chakrata road, Kempty Fall is a place that every tourist visiting this hill station would have it as a must-visit item on their vacation itinerary. Though it remains a bit crowded, it is a beautiful waterfall dropping off a mountain from a height of 4,500 ft. There is also the facility of cable cars to reach the Falls; the stairway is a long winding one and many prefer taking the cable car instead of walking. 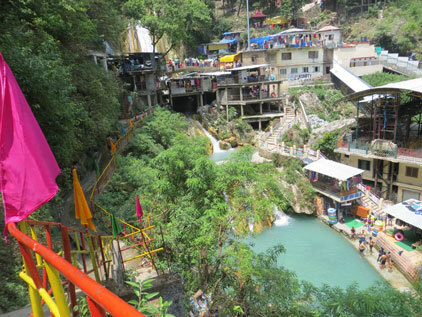 If you wish to take a dip in the cool water, you can rent out clothes from the numerous shops that are put up beside the Falls, just for this purpose. On our way to the Falls, we also stopped for a while at a viewpoint called Maggi Point (it is named so for the hot, tasty Maggi they sell) from where the view of the beautiful hills would take your breath away. Most of the 3 star and 5 star Hotel properties are located around this place. Another beautiful fall is the Jharipani Falls which is 6 kms away from Mussoorie but due to paucity of time we could not make it to this place. Our next stop was at Lake Mist. Situated 4 Kms. before Kempty Falls on the Kempty – Mussoorie Road, it is a unique spot for both relaxation and excitement. One can also enjoy boating in this lake, while indulging in other such activities. 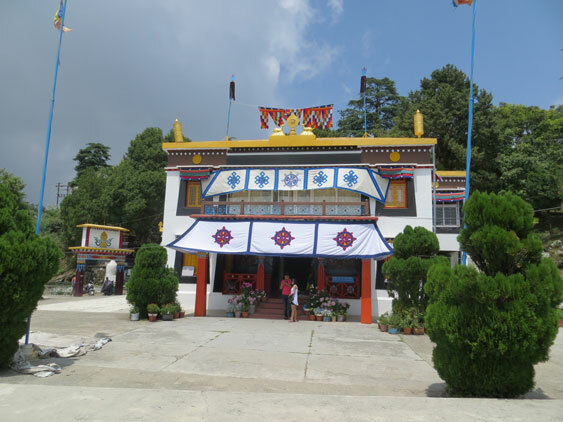 Though we did not spend much time here, it is a good place to be in during weekends, if you want to avoid the crowd and traffic of Mussoorie and recluse to its serene life. 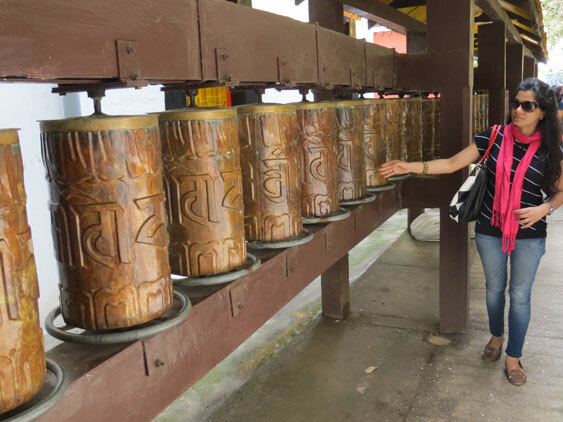 We next went to the Tibetan Buddhist temple located on the Happy Valley road, also known as the Shedup Choepelling temple. On way to this temple, we crossed the Lal Bahadur Shastri National Academy of Administration (LBSNAA), which I used to read about but now seeing it in front of me. 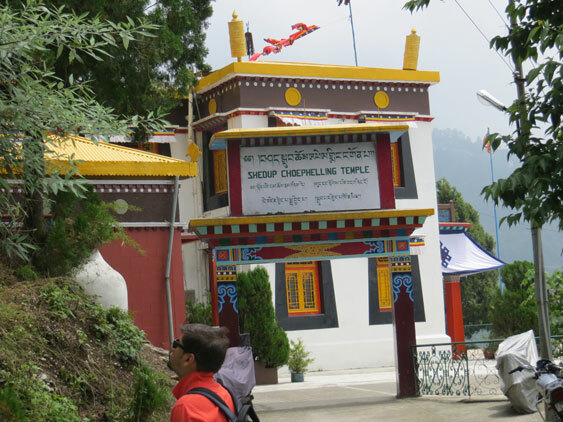 The temple has a divine atmosphere and can be visited between 7 AM to 5 PM. Though I have heard very few people visiting this temple, it is a good place to visit for those who seek solace and peace of mind. Since it was already 1 by the time we came out of the monastery, we decided to grab a quick lunch and resume our journey back to Delhi. We came back to Mall Road again to have lunch and to bid a (tearful) goodbye to this lovely place that we are leaving behind. Well, this has just been one part of the travel story; the corresponding story is that of Anjali who visited this hill station at the same time. Our purpose of visiting was however different. 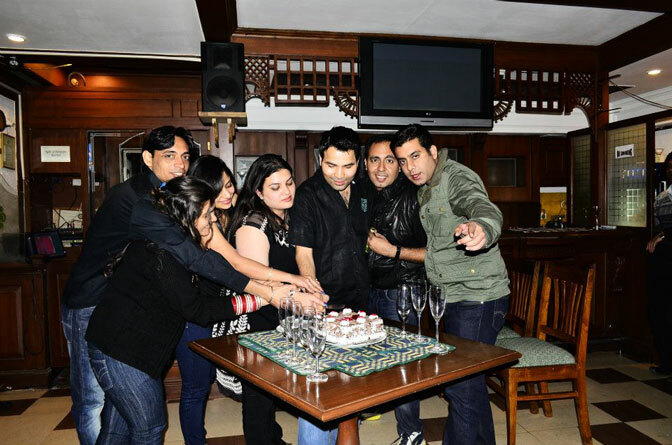 While I and my husband were here to enjoy the weekend in each other’s company, Anjali visited Mussoorie with her husband and friends to take a break from everyday routine and also to celebrate the birthday of another of their common friends. But we both had our own share of fun. “We are having the most wonderful moment here with our friends, Sammy,” she told me when we met co-incidentally at the Mall Road. Indeed, those occasions are rare when you take out time for yourself and your family to go on a trip but there are even rarer moments like this when you actually plan a quick trip with friends to spend time together, given everybody’s busy life. Those moments are always cherished for a lifetime. 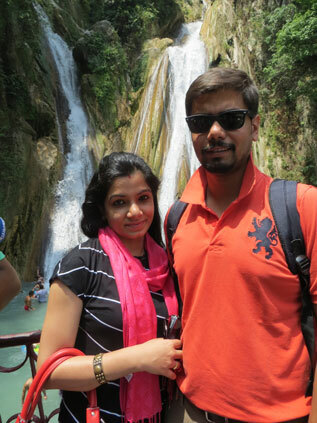 I was accompanied on the Mussoorie trip by my husband, my sister and her husband and another of our common friend. Our trip started a day earlier than Samrita’s, on Friday afternoon; and we reached Mussoorie around 7 in the evening. Since ours was a big group, we made several halts during the journey and it took us very long to reach Mussoorie. 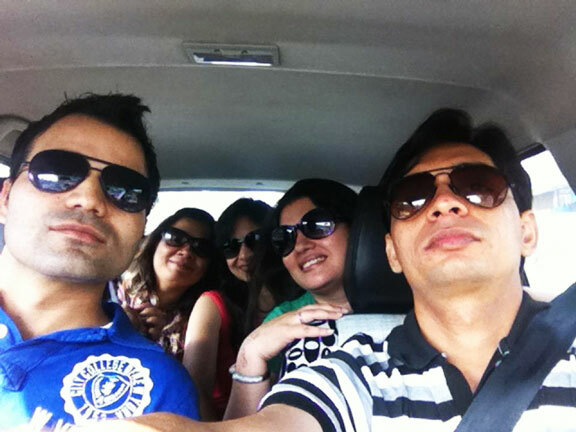 But nonetheless, it is always fun travelling in a group. 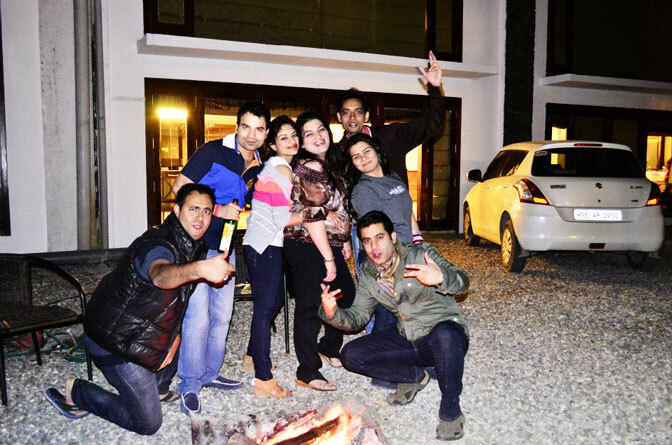 In spite of everyone being very tired, we planned to have a bonfire at night in the resort premises. It was our common friend’s birthday the next day and our Mussoorie trip was planned partly to celebrate it away from Delhi. We planned to remain awake till 12 at night and till then the celebrations continued. We shouted and screamed at the top of our voice, did some singing, played games and had all kinds of fun. Added to that was the beautiful weather; the sky was turning black and seemed like the rains would come down on us very soon. After wishing him at 12 and after a couple of selfies and groupies, we all went to our rooms. 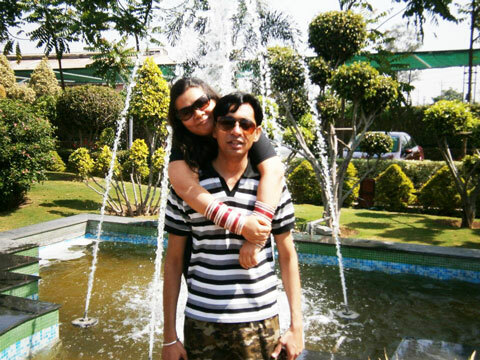 We have booked a nice resort in Mussoorie and to our relief, it was a great place to stay. Since it was raining when we visited the place, the weather had grown slightly cold and you could see the localites putting on their woollens before coming out of their homes. Unfortunately, we did not check the weather updates before leaving for the trip and so we did not carry anything warm with us. We had to spend our first night warming ourselves beside the bonfire and then quickly slip inside the warm quilts in our room. But what if the weather turns worse? We could not have taken a chance. And so the first thing we did in the morning was to rush to the Mall Road and shop for something warm, if not a sweater. I would have been the worst affected as I had just recovered from a severe cold and did not want to catch it again. We loitered around Mall Road the entire afternoon, clicking photographs of the local market and enjoying the beautiful weather. It was raining in the morning but had stopped for sometime in the afternoon. It was while we were at the Mall that I heard someone calling my name from behind and i was surprised to see Samrita there. We exchanged words for sometime, sipped hot tea at a nearby stall and then went our way. We had planned a surprise birthday party for our friend at one of the fine restaurants in the Mall. Our friend was taken aback when we gave him this grand surprise as he was the last person to have come to the restaurant. This was an extension of the fun we had the previous night. We ordered for a cake, since we could not do it the night before and had a gala time together. The people sitting around us looked perplexed at what we were doing, but we didn’t know them and so their stares did nothing to dampen our mood. We have come all the way from Delhi to have fun and we did not want to give it a miss. Late in the evening it started to rain. When it did not stop, we bought umbrellas from a boy nearby and started walking to our resort. Walking in pairs under the umbrella was another fun for us. We reached our resort, little drenched but fully satisfied of how our day was spent. We enjoyed to the fullest. It was time for us depart the next day from this beautiful town but we were taking so many lovely memories with us. It was a lovely trip, never to be forgotten and now that I have kids, I sometime wonder of whether I would be able to go on such a trip again. But then everything happens unplanned and I would just look forward for that day when I can be a part of such a trip, living in the moment like my old self again. If you wish to take a flight, the nearest airport is the Jolly Grant airport in Dehradun, which is 60 kms away from Mussoorie. 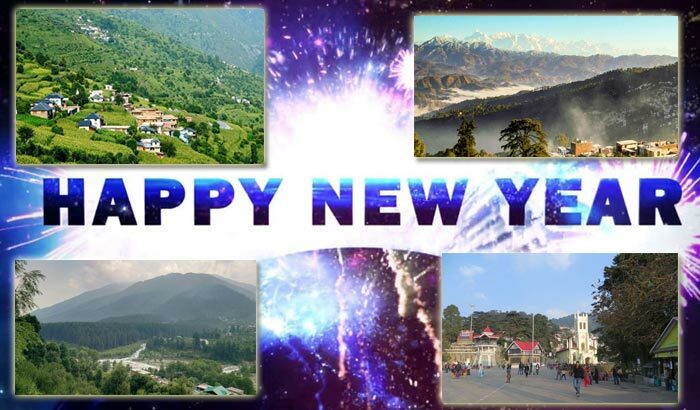 As there is no direct rail link with Mussoorie, Dehradun serves as the nearest railway station, from where one needs to book a cab to the place. 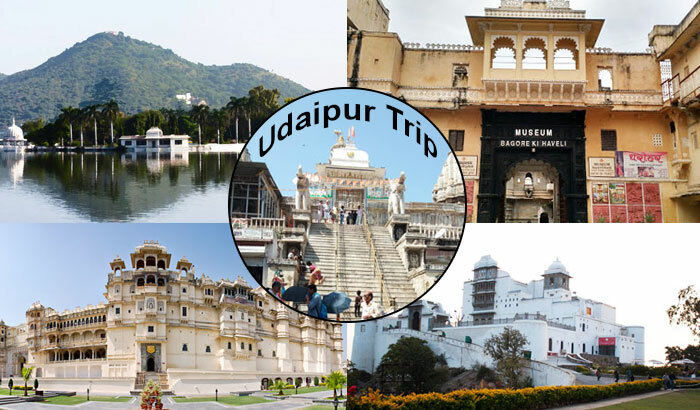 There are numerous trains connecting New Delhi with Dehradun, such as the Shatabdi Express (as well as the Jan Shatabdi Express), the Mussoorie Express, and the Nizamuddin AC Special. The journey lasts approximately 5.5 hours. There are buses that run daily between Delhi and Mussoorie and these include both Uttarakhand State Transport Corporations and private network buses. There are also many who prefer going by their own car or booking a private cab. The options are endless. The area adjoining the Mall Road and the Camels Back Road has a couple of hotels, resorts and lodges and they can be booked online. Barlowganj has several of the 5 and 3 star properties and resorts. The entire Mall Road stretch (starting from Kulri Bazaar to Gandhi Chowk) is an ideal place to shop for your favourite stuff, most importantly the wooden decorative items that these hill stations are most famous for. You can also buy small mementoes and souvenirs from the shops near Kempty Falls, which are good for gifting purpose. Share the post "‘The Queen of Hills’ Rules the Heart"
You have touched soome fastidious things here. aree really sharing good thoughts. Thank you so much. Lovely comments like this inspire us to write from our heart. Do not forget to send us your valuable feedback and suggestions on travelrasoi@gmail.com. We value it a lot.